Behind the Bit: Gone at last? Gone at last! Gone at last? Gone at last! Sunday night Bob and I watched a PBS tribute to Paul Simon, and one of the performers sang Gone at Last. Not to get too dramatic, but where Riley is concerned this past year, the song hit close to home. We were singing Gone at Last at the top of our lungs (it was a great special). Wednesday when the farrier came out to trim/shoe Riley, he found a new "problem area" in the toe on the same tract as the surgery site. The surgical wound has totally grown out, so there should be clean growth there. The problem area, or defect, was similar to one he had last spring -- a hole/crack filled with crumbly chalky dead stuff and black gunk. The farrier cleaned it out, and my heart stopped when I saw the thumb-sized notch in my horse's toe -- again, this was like a replay of last year. Oh, No. Not again. There is one big difference though -- he's been sound since March. What else might it be? An opportunistic bacteria/fungal infection entering a weakened/cracked hoof (from the bottom of the hoof). Trauma/concussion to the lamina cause blood and serum accumulate inside the hoof, creating an environment for bacteria/fungi inside the hoof. I called the vet and ordered x-rays. Over the weekend I treated for WLD with a highly recommended product called White Lightning, and consoled myself that Riley was sound -- if he's sound, anything we find is likely to be in the early stages. X-rays can help indicate a) if there is WLD and b) the likely source of the infection. If the problem stems from damaged lamina and serum accumulation, there should be a gas tract/empty space emanating from the dorsal side of the hoof. If the "empty space" starts at the base of the hoof (see right -- NOT Riley's xray), it's likely that bacteria/fungi are entering the white line through a crack through the sole of the hoof. What did the x-rays say? The lateral views showed NO gas tract -- the lamina above the defect was strong and smooth, in fact better than it looked in January. We took a picture of the "shark bite" out of Riley's pedal bone. No change, edges clean, no sclerosis. 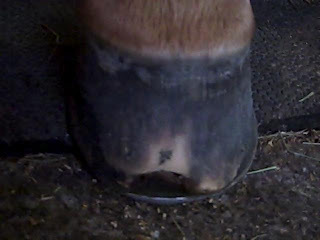 Okay, so why the thumbsized defect in the hoof? I dimly remember the Farrier at New Bolton telling me that the surgery typically creates a bulge on the hoof above surgical site, and he showed me a bulge at the coronary band. He said we'd need to watch it as it grew down as it's a weak area -- maybe this is the last artifact of the surgery? It could be that, or it could be WLD I suppose. I'm going to treat it as if it is. In the meantime, I can truly enjoy my horse. 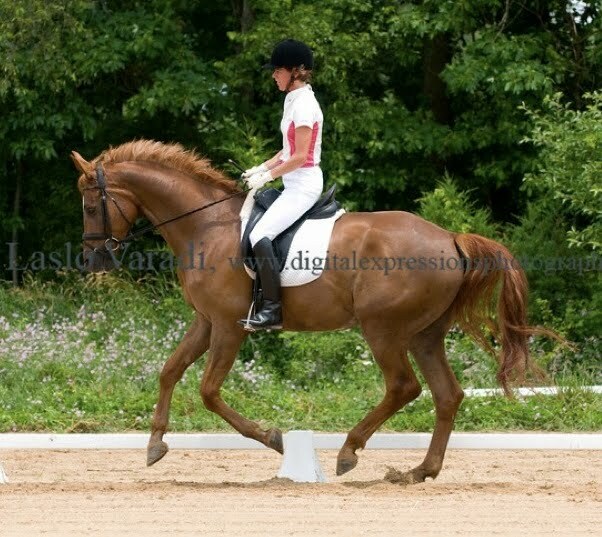 Here is a professional photo of Riley at last week's horse show! Did the vet suggest scraping a sample of the area and having it analyzed? Sounds like you are doing everything right. Just wanted to say that is a GREAT picture of you too! Beautiful. Vettech, no and I didn't ask b/c I'm not sure how it would change treatment -- from what I understand WLD is poorly understood and much of the time nothing shows up in the lab tests. His toe now looks a lot like Tucker's. Tuck had some infection in the toe wall as well. X-rays were normal too. Hard to say what it's all about. As long as he's sound....don't panic. Lovely picture. I like how it captures Riley's energy. Looks like a keeper to me. I'm beginning to realize that no horse is perfect. As long as they are sound and happy we should be happy to. Sounds like Riley is a very happy boy these days, so breath easily! You are a good mommy and looking out for your boy. He couldn't ask for more. He looks great! Could be WLD, might not be, but it's probably a good idea to treat as you are doing anyway. Zeus, my Belgian gelding who had the same surgery, has always had a soft spot on his sole about the size of a quarter where the end of his incision closed. We have found that using apple cider vinegar on it in the wet months really helps, though he can get thrushy there. I'm hoping its something simple like that!